I am proud to have received more than 180 5-STAR reviews on Google! Click here to read them! As a Master Dog Trainer for more than 15 years, I have successfully trained more than 5,000 dogs in Greater Northwest Houston, including in Cypress, Spring, The Woodlands, Champions, Katy, and Tomball. 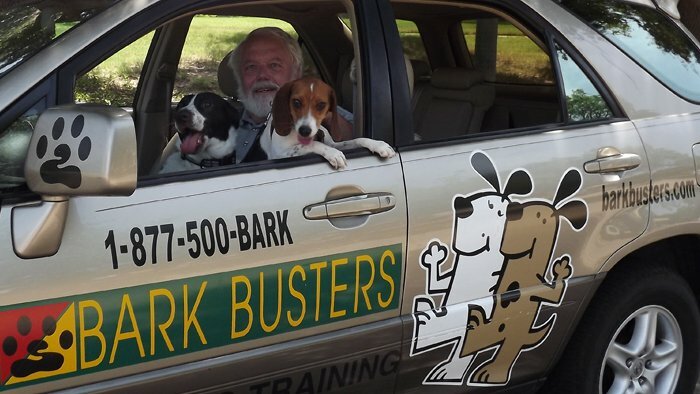 No one is more familiar with the effectiveness of the local dog training alternatives than our own veterinarians, and many throughout Houston overwhelmingly recommend the Bark Busters dog training method, call them and ask. They know our mission is to prevent dogs from being euthanized or abandoned due to bad behavior. Too many dog owners trade in their dog in hopes of replacing him or her with a 'good dog.' We believe any dog can be a 'good dog' with the right training. In home training! We come to you! Your home, yard, and neighborhood are where your dog issues actually occur, not at doggie 'boot camp'. Free of unusual distractions (group training), your dog will quickly learn to follow your house rules. We start in the home, but all outdoor behavior training is included too! I'll help you safely and positively achieve socialization with other dogs and people in public settings avoiding or reversing aggression, fear, and low confidence. Personalized dog training! No 'one size fits all' like group dog training or puppy training classes. We develop a personalized one-on-one lesson plan based on your dog's particular personality, perspective, and your goals. You'll learn how to read your dog's reactions and adjust your communication as needed depending on how your dog is responding. Our first dog training lesson will last approximately 2-1/2 hours. When you reinforce our techniques approximately 10-15 minutes a day, you'll begin to see awesome results. Positive dog training! No shock collars, pain, intimidation, or clickers. Unlike some trainers, we at Bark Busters don't use harsh techniques or bribe with food to extort good behavior. Our dog training focuses on using dogs' natural instincts to work toward a win-win situation for you and your dog. Trust, clear communication and understanding each other produces longer lasting results than treat training or force. Effective dog training. You will learn more in our first training lesson and get better results than in group classes that last six weeks. Dogs understand 'dog speak', not 'people speak' so it's no wonder they can't understand our verbal commands. We will teach you how to communicate with your dog in a language he understands. You will learn how to use your body language and vocal communication to get your dog to focus on you and respond to your directions. No limitations. I will help you train any dog, any age, any issue. Together, we will make sure you have a well-behaved dog - guaranteed! Puppy Training. With our in-home training, we can get your puppy started at an earlier age, without the fear of exposing him to unknowns prior to completion of vaccinations. Life of Your Dog Guarantee. Our Life-Of-Your-Dog Guarantee goes wherever you and your dog go! Bark Busters is the only company with International Support & Unlimited Training. This guarantee is automatically transferred. It stays with your dog even if you move - or- if your dog is temporarily or permanently re-housed! If your dog could talk, he would tell you to call me. Why? Because your dog really wants to please you, he just doesn't know how. Once you are on the same page and speaking the same language, you'll begin to enjoy the relationship you and your family have always imagined with your loyal companion. We adopted a beautiful German Sheppard mix. He was very hyper when he met new people and was not very friendly with the cat. This along with other habits changed with just one session that gave us great guidance to continue working with him on. I will recommend this company to anyone that needs even the smallest training with their dog or puppy. Very enjoyable encounter with our trainer from Bark Busters. We learned a lot and are anxious for our next visit. Snap and growl is an amazing thing. I was blown away. In two hours it was like having a new dog! No jumping, chewing, nipping. He finally started to behave after 4 weeks of trying to train him on my own. I was ready to give the dog back. Thanks to Bob with Bark Busters we didn't have to. My son was so happy. I highly recommend Bark Busters.